Is there anything more certain of putting a smile on a reader’s face than the works of A.A. Milne? I say this having just finished Once a Week, a wonderful collection of his pieces for Punch, which had me giggling all Sunday morning, but it is equally true of Mr Pim Passes By, a delightful play from 1919 which I read back in May. When Mr Pim, an absentminded traveller, drops by Marden House one afternoon, he leaves chaos in his wake. Having innocently mentioned the name of a fellow traveller on a recent sea voyage, he has set the household on its end. Is the first husband of Olivia Marden, the lady of the house, still alive? Her conventional, rigidly proper husband George is horrified that his beloved wife might, the horror of it all, be a bigamist and not his wife at all. As Mr Pim returns at intervals to amend his account – his memory being rather sieve-like – George and Olivia face a revealing crisis point in their relationship. Will George be guided through this turmoil by his innate sense of honour and fair-play, which would have him wave his rights to Olivia and return her to her first husband, or by his affection and love for the woman he married, which would urge him to fight for her? How improperly is he willing to behave to keep Olivia? BRIAN. Of course I know what you want, Dinah. BRIAN. You want a secret engagement, and notes left under door-mats, and meetings by the withered thorn, when all the household is asleep. I know you. BRIAN. Dinah, you’re a heavenly idiot. And you’ve simply got to marry me, uncles or no uncles. DINAH. It will have to be ‘uncles’, I’m afraid, because, you see, I’m his ward, and I can get sent to Chancery or Coventry or somewhere beastly, if I marry without his consent. Haven’t you got anybody who objects to your marrying me? DINAH. Well, that’s rather disappointing of you. I saw myself fascinating your aged father at the same time that you were fascinating George. I should have done it much better then you. As a George-fascinator you aren’t very successful, sweetheart. BRIAN. What am I like as a Dinah-fascinator? BRIAN. Then I’ll stick to that and leave George to Olivia. Leaving the difficult George to Olivia, as Brian proposes to do, is a very solid plan. George, though he the kind of gentleman I like best, is not an easy man to live with – as the story opens he is arguing with his wife about the orange curtains she wishes to order, which he decries as too modern – but Olivia clearly knows just how to deal with him. She is frustrated by him, disappointed in him at times, but she does love him and, I think, is entirely confident of her ability to bring him around to her way of thinking – eventually. That is precisely why it is significant that she largely leaves George alone to puzzle through how he should react to Mr Pim’s shocking news. Milne has brilliance for writing female characters. His men are useful to have around but never enchant or delight, beguile or provoke the way his women do. Belinda is still probably the best example of this from the few plays I’ve read, but Dinah and certainly Olivia both severely outclass their male counterparts. Dinah does this purely in terms of charm and vitality but Olivia…Olivia intrigues the reader. Initially, I found her behaviour irritating, thought her too passive given the situation. Then I thought her almost cruel. Then clever. She is warm but, at the same time, reserved. Writing this review has made me want to reread the play just to encounter her once more. Or, better yet, to read the novelisation, which Simon reviewed last year, for a slightly different approach to the story and its characters. Though bigamy is – as George would tell you – a serious issue, the plot and characters here are typically light. Serious issues are discussed flippantly but intelligently and though the potential for disaster is certainly there, there is little doubt in the reader’s mind that everything will end well. Lovers will be united, marriages will be strengthened, and, in this particular play, curtains will be bought. I didn’t know this existed, but now that I do I am going to have to search out a copy. I love Milne’s humour. Off to the secondhand sites! Thank you. It does exist and it’s delightful, so I hope you can track a copy down! If not, electronic versions are available (I know Project Gutenberg has it). Thanks, Simon! I remember you talking about Irene Vanbrugh’s autobiography a while back and took note but really had no idea at the time who she was. Now, I’m quite eager to read it and learn more about the woman who did justice to Milne’s creations! 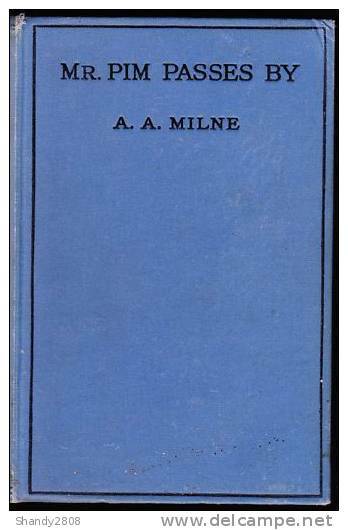 Sadly, my library system doesn’t have a single adult book by A.A. Milne. I’ve been reading more and more blog posts about his other works, though, so I’m keeping my eyes out for some titles at used bookshops. Sorry to hear that you’re library can’t oblige you with any of Milne’s adult works, Jeane. A fair number of his plays (and some of his other works) are available for free online so if you have an ereader or are willing to read off your computer that might be easier than tracking down elusive used copies. Also, I’d love to know where else you’ve seen blog posts about Milne! I think Simon is the only other blogger I know who is familiar with Milne’s adult works so it would be great to meet others who enjoy his writing. Ditto to Simon – a wonderful review of Mr. Pim Passes by. Off I go to see if I have more luck than Jeane with my lifrary system. Thanks, Penny. Good luck with your library search! Oh yes, he may have dabbled in children’s books but the bulk of his output was for adults and it is wonderful! I’ve now read a handful of his plays, his autobiography, some of his pieces for Punch, and one of his novels and I’ve loved it all. Hm, I can’t think where else I’ve heard of his adult books except here on your blog. Those posts really stand out for me, though! Thanks so much for you wonderful review of Mr. Pim! The name appeared in a crossword puzzle; neither my wife nor I had heard of the play so we googled it and found your review. Your honest comments and clever choices of excerpts have made us want to look this one up. Bravo!